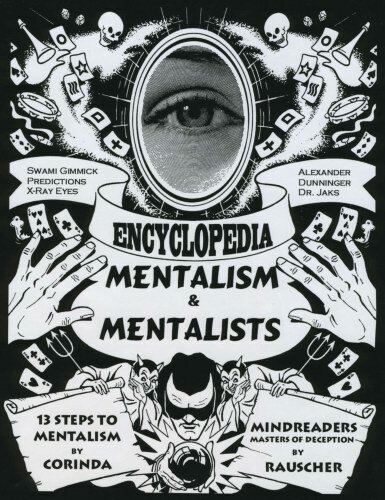 The Encyclopedia of Mentalism is destined to become the essential book for every mentalist's library. Effects from every theme of mentalism is covered (telepathy, clairvoyance, precognition, etc). This newly released book contains the complete contents of Tony Corinda's classic "The 13 Steps to Mentalism" which contains nearly 600 pages of must-have information on performing feats of mentalism. Originally released as 13 booklets, these were later combined into one book which become the classic in the field. But now, for the first time, also contained in a single volume are an additional twelve fascinating chapters detailing the lives of mind readers past and present. THIS NEW EDITION IS MUCH LARGER THAN THE ORIGINAL "13 STEPS TO MENTALISM"
Even if you have the 13 Steps of Mentalism, your library won't be complete without this new version which combines, for the first time, these two books. Price $54.95 + $5.00 shipping US. / $12.00 International.